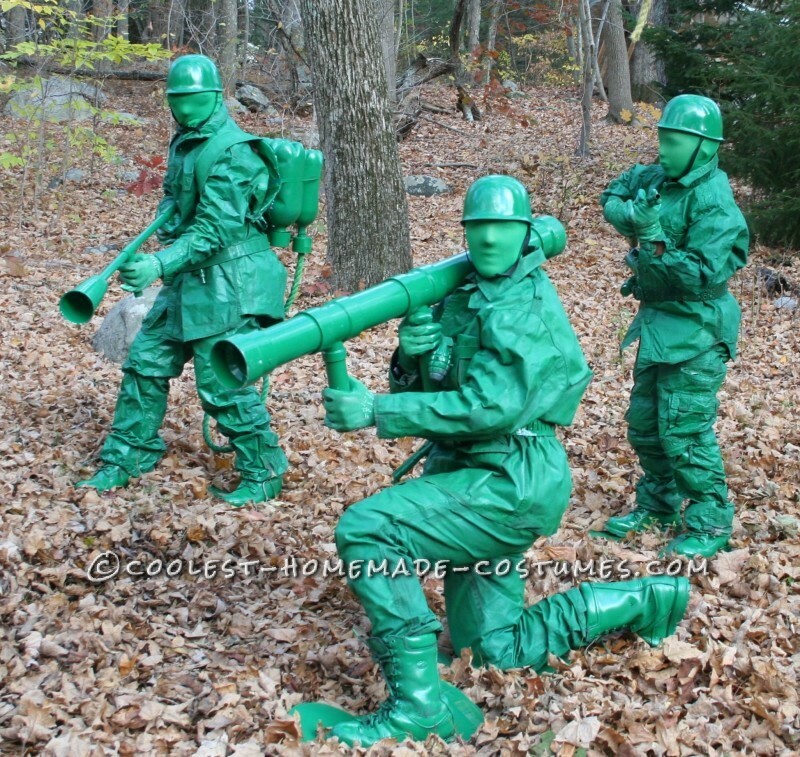 This toy soldier army of three costume was a huge hit this Halloween. 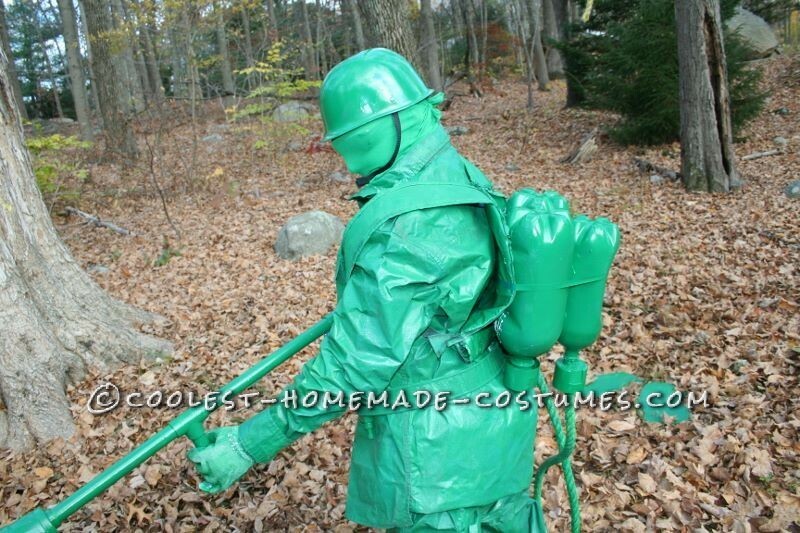 We perused the internet for the green army men ideas and set out on our own adventure to make this way too costume! We first had to decide which army dude each wanted to be. I chose the bazooka guy, my youngest, the Sniper guy and my middle son, the Flamethrower guy. Next, we headed to Savers ( super thrift store chain). When you are shopping army, think lots of pockets. Pants, cargo style in extra large sizes are the best way to go. We each picked out a way too big shirt and way too big pants. Next, we went for some super cheap wide belts. 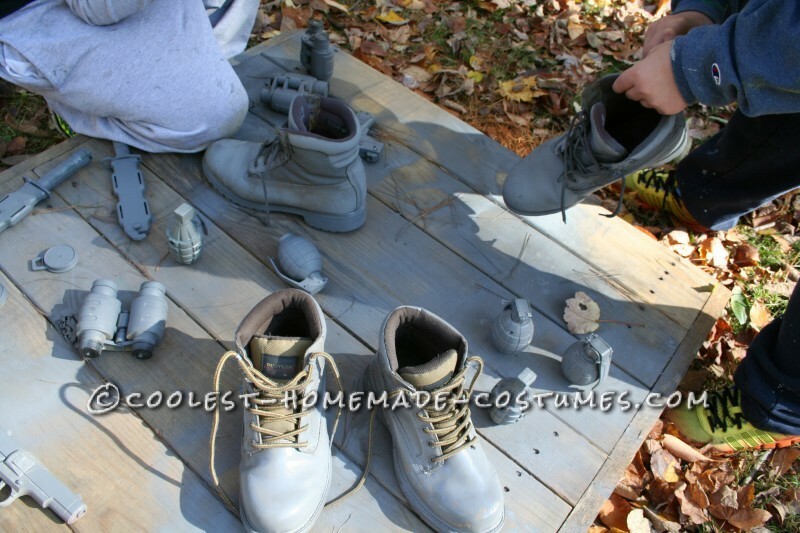 And lastly, the most difficult to find were work boots in our sizes and in our budget. After scouring three different thrift stores, we found what we needed. I wanted to keep the clothes around $25 bucks per person, if you had your own even better, but make sure they are way too big for you. Next, we hit the dollar tree. Grenades, knives and cheap hand guns ( to accessories our belts). We each spent $5 each Plus $1 each for cotton gloves. Helmets to fit our head had to be purchased at the Spirit Halloween store for around $6 each along with a pair of Kelly green pantyhose ( used to cover our faces). Then we headed to Home Depot for primer and paint and PVC pipe. 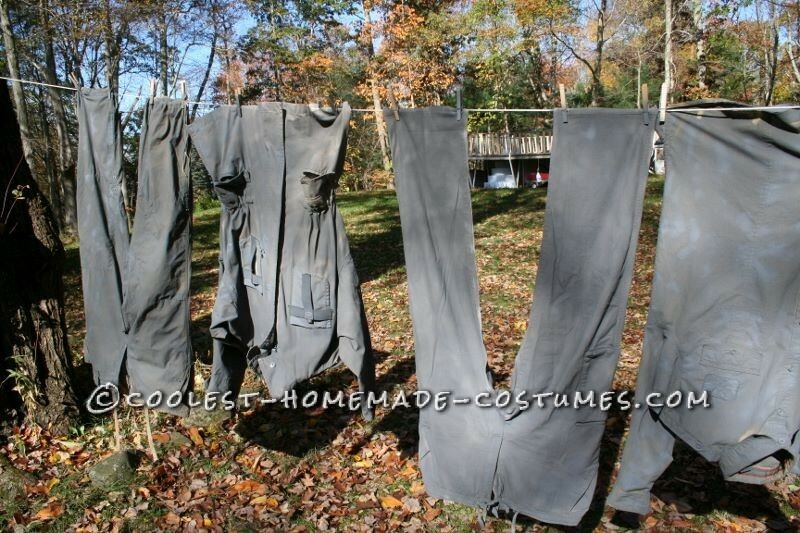 Gray primer spray paint to give everything a base even the clothes. We hung each of the clothes on a clothes line in the back yard and did the shoes and accessories on a pallet. Mother nature was on our side giving us a solid week of dry warm weather. Pretty good for New England in October. Once the primer dried, we gave a good coat of Meadow Green spray paint. One coat was not enough; not nearly enough. I initially bought 14 cans and quickly used them up. The grand total of cans after cleaning our every home depot in a 50 mile radius was 52 cans. At almost $4 a can; well you do the math. But once we started, we could not stop until we were all shiny green. The bazooka was made out of a couple of sections of 4″ PVC pipe cut to fit with two T’s to put the handles ( smaller pipe) and a couple of connectors to enhance the look. It all ran about $12. Next was the 1″ pvc to construct the Gun part of the Flame thrower. ( Again a couple of sections with T’s to make the gun). A large piece of thick nylon yellow rope, maybe four feet or so to attach one end to the gun, the other to the back pack. Yes, I cut up one of the kid’s old back pack, taking off the pocket part and leaving just the back panel and the straps. I glued two three liter soda bottles and one two liter bottle to make the “gas tanks” (Use a glue gun for all gluing). I glued the ends of the spray paint cans to the end of the soda bottles for a better look and then glued one end of the rope into the bottom of the two liter bottles spray can top (fit perfectly), the other end of the rope was glued into the PVC attachment at the end of the gun (don’t know the name for all the PVC parts), I just shopped and put together as I was going. The end of the gun was a McDonald’s cup with a hole cut through it. Again all painted meadow green and Voila, an awesome looking flame thrower! Again, parts were about $10 and some time in the neighbors recycle bins. While there, I retrieved some juice bottle caps and some small Jiffy Muffin boxes. I glued the caps onto the boxes, added a straw with a pen cap on the top and made three walkie talkies. Once the clothes were dry, we did a trial fit. Boy were these clothes STIFF. I mean, stand up on your own STIFF. We needed an ARMY of three just to put them on. I had to break the top buttons on the shirts and the pants just to get them on. So now I had to glue some Velcro on the pants and the shirts tops to hold them up. With great relief, we managed to get the clothes on and they did somewhat soften up the more we wore them. We posed for some pictures which my oldest son took. And then had to wait for Halloween ( the next day). Well, we suited up for the big Halloween parade in our town. We originally had the stockings for masks, but soon found out that to eat or talk or see in the dark was going to be a bit of trouble. AH HA, I had bought some green face paint while at Spirit Halloween just in case ( I am a just in case kind of person), plus dealing with kids I know they can complain and I wanted none of that. We did use the stocking to cover our hair and this worked great since mine is long and hard to fit under the small hat. Dressed in the full outfit.The kids with help first and me last. The green paint looked great (not as cool as the stocking, but definitely more practical). We were the hit of the PARADE! Everyone was in absolute awe of our costumes! We had originally put cardboard cut-outs on our feet, but with moving around so much, they came off with relief since they were tough to walk in. It did not take away from “THE LOOK”. We were posing all night for pictures. We will definitely be wearing these again. I am going to modify and make use of para troopers next year. I’ll let you know how they come out.